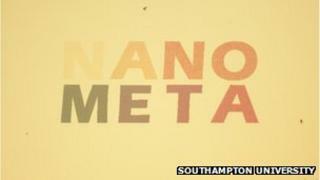 Scientists in Southampton are now able to change the colour of gold. The technique involves embossing tiny raised or indented patterns on the metal's surface which alters the way it absorbs or reflects light. Prof Nikolay Zheludev, who leads the nanophotonics and metamaterials team at Southampton University, said it means gold can be made red or green or a multitude of other hues. It can also be applied to other metals such as silver and aluminium. The shape, height and depth of the embossed patterns determines how light behaves when it hits the metal and therefore what colour is created, said Prof Zheludev. "This is the first time the visible colour of metal has been changed in this way. "The colours of the objects we see all around us are determined by the way light interacts with those objects. "For instance, an object that reflects red light but absorbs other wavelengths will appear red to the human eye. "This is the fundamental principle we have exploited in this project. By embossing metals with patterns only around 100 nanometres across, we've found that we can control which wavelengths of light the metal absorbs and which it reflects." Prof Zheludev said the team is trying to market the technique, which could be used in jewellery making, commercially. He believes it could also be incorporated into documents and banknotes as a security feature because the metals are difficult to forge. Details of the research have been published in the journals Optics Express and the Journal of Optics.. The scientists received funding from the Engineering and Physical Sciences Research Council as part of a £5m project looking at photonic nanostructures.